Jupiter, FL – October 26, 2018 – Hump Day shows at Guanabanas Island Restaurant & Bar are usually reserved for a single, energetic act. 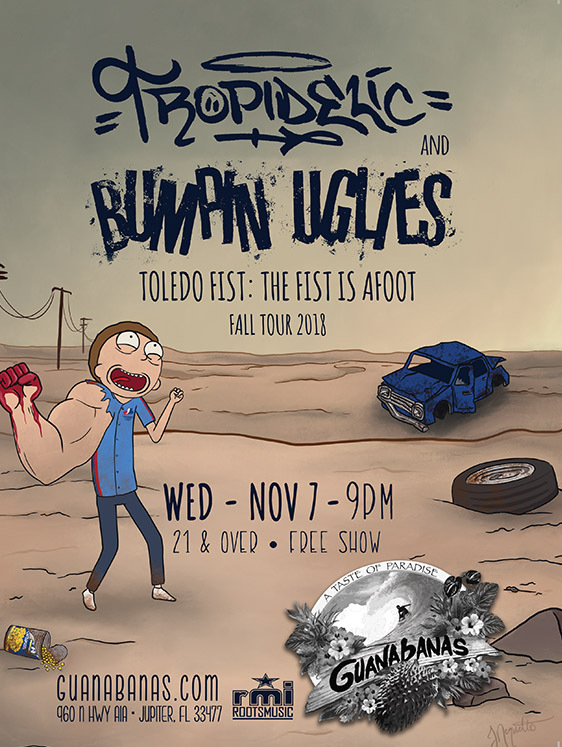 On Wednesday, November 7, 2018, Jupiter live music fans will be treated to a double header of the rock / reggae touring bands known as Tropidelic and Bumpin Uglies. The music begins at 8 p.m., the show is free and open to 21 and over. Guanabanas is located at 960 North Highway A1A Jupiter, FL 33477, near the Jupiter Inlet and on the east bank of the Loxahatchee River. “These two bands together make for an instant party,” says Talent Buyer Matt Cahur. “I’m looking forward to unleashing their good time musical energy on our Wednesday night regulars.” Cahur is the founder of Roots Music, which manages acts, and produces and promotes local and regional concerts. In addition to booking acts and providing hospitality at Guanabanas, he is the lead sound engineer. Tropidelic is six-piece funk / reggae / rock / hip hop from the East Side of Cleveland, OH. The year 2017 saw the release of the band’s latest, Heavy is The Head, which hit the top spot on the iTunes reggae charts upon release. They have shared the stage with and supported such acts as 311, Slightly Stoopid, The Dirty Heads, Pepper and TheWailers. Tropidelic have hit the festival circuit heavily recently, playing Electric Forest,the Werk Out Festival, the Warped Tour, SXSW, Reggae Rise Up, and Cali Roots. Learn more about the band here: www.tropidelic.com. Bumpin Uglies hail from Annapolis, MD, and are self-described as “a curiously fun mix of ska, reggae and good ole’ punk rock.” They have been musically raised on everything from Bad Religion and The Beach Boys to Sublime and Reel Big Fish. The quartet’s brand-new release is called Beast from the East, and features guest appearances Derek McBrydeof Tropidelic, plus members of Sun Dried Vibes, Ogee Wawa, and others. For more on the band, visit www.bumpinugliesmusic.com. Their current joint tour last through mid-November and has them winding up and down the U.S. East Coast before hopping to Texas. Bumpin Uglies will then head up to the Northeast, and toward the Midwest into the New Year. Tropidelic will loop back around the Northeast through the end of this year. 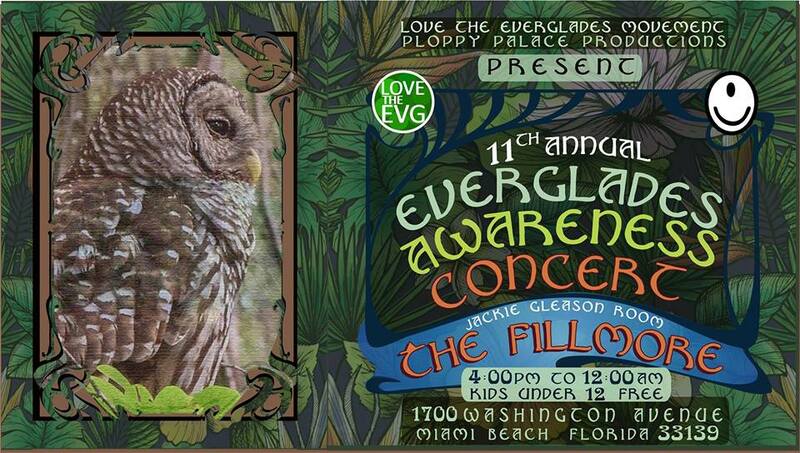 For more information about the show and the venue, visit www.Guanabanas.com or call 561.747.8878. Guanabanas is an open air restaurant and bar with woven tiki huts and banyan trees towering overhead and hand-chiseled coquina stone pathways underfoot. The team maintains a laid-back, island atmosphere where everyone is welcome. The award-winning menu features a fusion of Mexican, fresh Florida seafood and traditional fare; an all-new brunch menu is available Saturdays and Sundays. Guanabanas offers a custom catering menu and signature cocktails. Executive Chef Vinny Trupia oversees the culinary operations and also manages a community garden at the neighborhood resource center El Sol. Mouse King Returns for a Sixth Holiday Season! Who: Sesame Street veteran Noel MacNeal and award-winning singer / songwriter and prolific composer of children’s musical theater Jim Camacho, the cast of the 2018 production. What: MOUSE KING a family-friendly holiday musical and South Florida tradition written by MacNeal and Camacho. The magical “Kingdom of Sweets” comes alive once more. 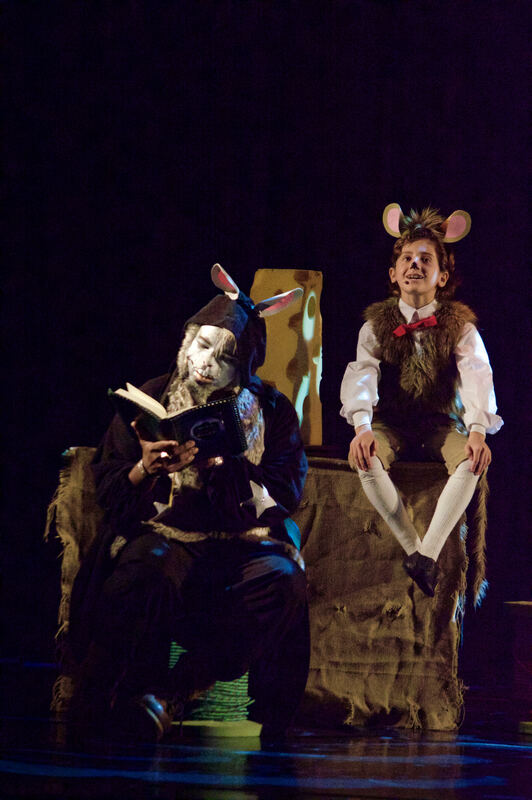 Mouse King revisits the story of The Nutcracker as told from the point of view of the mice. 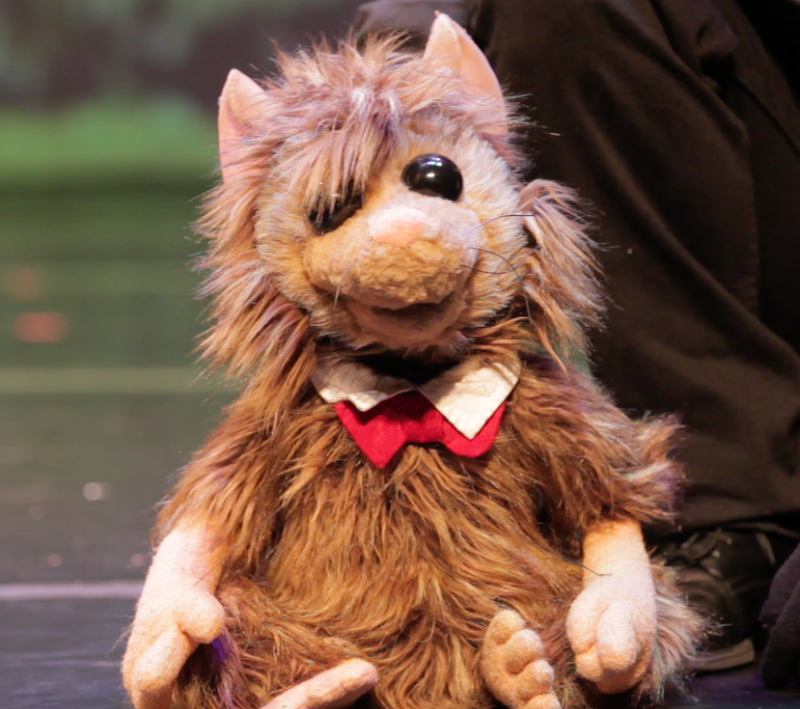 With master puppeteers and guest artists from New York City, along with a cast of talented child actors from the Miami community, MOUSE KING brings an imaginative twist on the Nutcracker to life. Due to five consecutive years of sell outs and by popular demand, this year’s production will enjoy a second weekend of performances for the first time. Friday, December 7th, 7 p.m.
Saturday, December 8th, 2 p.m.
Sunday, December 9th, 2 p.m.
Friday, December 14th, 7 p.m.
Saturday, December 15th, 2 p.m.
Sunday, December 16th, 2 p.m.
Where: The Mandelstam Theater, 8530 SW 57th Ave, South Miami, FL 33143. Tickets: start at $25 online at http://mousekingtickets.com; reserved seating is available. Pre-sale tickets highly recommended, as shows will sell out. More information: www.JimCamacho.com or 800.838.3006. Latin funk band to play a free show at the premier Jupiter waterfront venue beginning at 9 p.m.
Jupiter, FL – October 15, 2018 – The band that kicked off the successful Noche Latina series at Guanabanas Island Restaurant & Bar three years ago is back to celebrate a very special milestone. 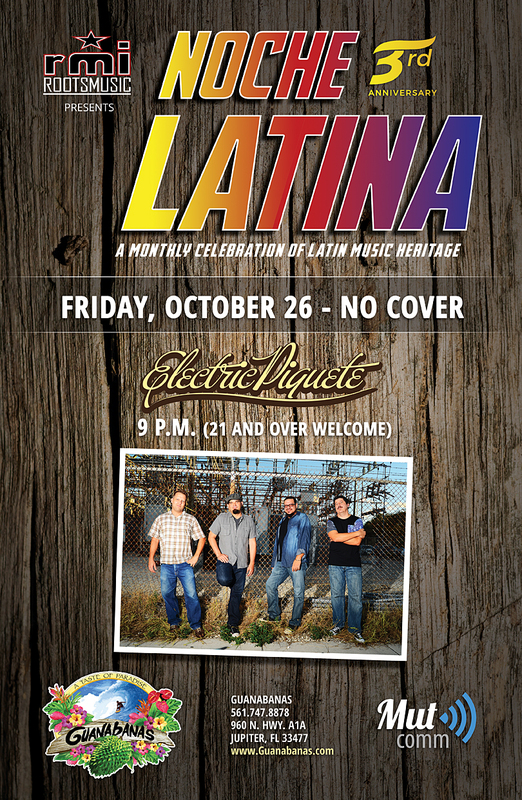 Electric Piquete – two-time Miami New Times’ “Best Latin Band” award winners – will perform one two-hour set on Friday, October 26, 2018, beginning at 9 p.m. Guanabanas is located at 960 North Highway A1A Jupiter, FL 33477, directly on the east bank of the Loxahatchee River. The show is free and open to those 21 and over. “Electric Piquete is a cornerstone band for Noche Latina, having played here numerous times during what’s become a very popular event for Roots and Guanabanas,” says Talent Buyer Matt Cahur. “I am proud to welcome them back and continue to grow the series as it rolls on in its monthly trek.” Cahur is the head of Roots Music, which specializes in music management, production and promotions of local and regional artists and concerts. He wears many hats, being the lead sound engineer at Guanabanas. Electric Piquete have fully incorporated Caribbean rhythms into their sound, covering and recording tracks by standout Latin artists such as Celia Cruz, Mongo Santamaria, Cheo Feliciano. They revel in their Hispanic roots and have even written songs about Jose Marti and Cuban beaches. Their music has already been licensed by Lexus, and featured in the Emmy-winning Joe Cardona documentary Miami Boheme, plus an episode of CNNGo. The band features co-founder Ed Rosado on drums / vocals, co-founder Michael Mut on bass / vocals, Chris Correoso (guitar), and Rich Dixon on trumpet and flugelhorn. The band’s sound is very often augmented by Raymond Ayala on percussion and vocals, Charles Gardner on keyboards, and Robert Smiley on tenor sax and flute. Occasionally, the band features special guests Damian J. Sanchez on saxophones and flute, Maco Monthervil on vocals, and Jose Miranda on trombone. For more information, visit www.ElectricPiquete.com or call 786.426.2277. 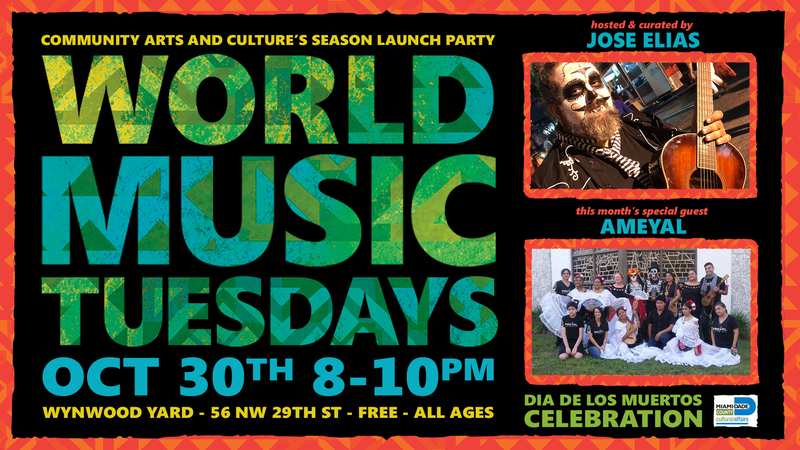 Miami, FL – October 9, 2018 – Miami-based non-profit Community Arts & Culture will launch its 2018-2019 season with a special Dia de los Muertos celebration at the Wynwood Yard on Tuesday, October 30, 2018. Hosted by the organizations founder / director Jose Elias, this five part series will take place once a month at the family-friendly, open air venue and showcase groups that represent cultures from around the world. On October 30th, the Mexican folklore group Ameyal will perform songs and dances that celebrate the Dia de los Muertos holiday with live music, demonstrations, and a Q&A segment as well. This event is presented with the support of the Miami-Dade County Department of Cultural Affairs and the Cultural Affairs Council, the Miami-Dade County Mayor and Board of County Commissioners. Miami, FL – October 3, 2018 – Cortadito, the Cuban folk band led by musician and producer Jose Elias, will continue their weekly Thursday night residency at the Brickell City Center’s Italian eatery La Centrale during the month of October. The band’s trio format will play from the hours of 7 to 9 p.m. at the venue, located at 601 S Miami Ave, and patrons can not only enjoy traditional Son Montuno compositions and fine dining, but free rose wine during the event. Elias is also the founder and director of the local non-profit Community Arts & Culture, organizers of the long-running Afro Roots Fest. Cortadito also serves as the backing band for Eliades Ochoa, one of the original members of theBuena Vista Social Club. For more information about the series, visit https://www.facebook.com/events/492295834571413. For more on the band, navigate to www.CortaditoSon.com. 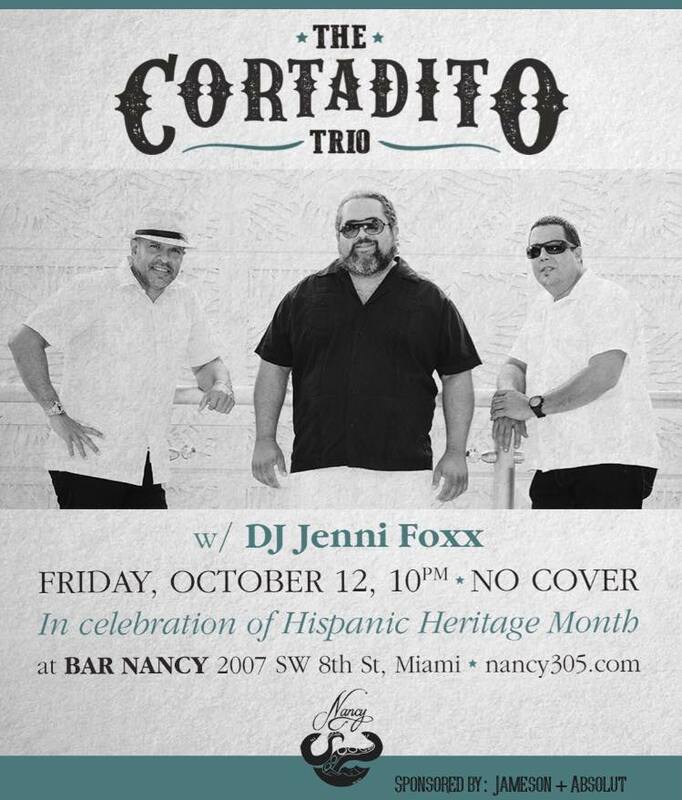 When: Thursdays in October (4, 11, 18, 25), 7 to 9 p.m.
Miami, FL – September 26, 2018 – Bar Nancy is planning to celebrate Hispanic culture by serving up some Cuban Cortadito on October 12, 2018. The Miami-based folk trio will debut at the souwesera craft cocktail tavern located at 2007 SW 8th Street, Miami, FL 33135 during the venue’s Hispanic Heritage Month celebration. The show begins at 10 p.m. and there is no cover; 21 and over are welcome to attend. “We’re very excited about playing the Nancy for the first time and it couldn’t have been timed better,” says group co-founder Jose Elias. “Our sound is perfect for the location and the occasion, and we are looking forward to delivering an incredible experience for Cuban music fans that night.” Elias is also a producer and the Executive Director for the non-profit organization Community Arts and Culture. Founded in 2011, Cortadito has already played its share of parties, lounges, bars, and festivals. Most recently, the group backed legendary Buena Vista Social Club member Eliades Ochoa at the Los Dells Festival in Wisconsin, the first major Latin music festival in the Midwest, and soon to be the largest such festival in North America. They also accompanied him and wolrd renowned percussionist Sammy Figueroa at this year’s GroundUp Music Festival on Miami Beach in February. This fall, the group will once again team up with co-founder Julio Cesar Rodriguez Delet for the debut of their second EP release titled Canciones de Julio, which features five original compositions written by Julio Cesar, including the classic “Casa de la Trova”, penned by his father Julio Rodriguez. The band is currently enjoying a weekly Thursday night residency at La Centrale Italian Food Hall in the Brickell City Center. The décor at Bar Nancy is colonial-era nautical, and once inside, one gets the sense of being below deck and in the galley of a ship. Wood-lined walls, and wooden tables and chairs lend a natural essence to the place. Nancy’s sizable selection of draft and canned beers, as well as specialty cocktails set it apart from other Little Havana watering holes. The bar also showcases a monthly “songwriters in the round” night hosted by Juan Turros, as well as a daily happy hour 4 to 7 p.m.
For more information about the venue, navigate to www.nancy305.com or call 305-397-8971. For more on the band, please visit www.cortaditoson.com. Cortadito’s focus is on performing the traditional Cuban music of the early 20th century. 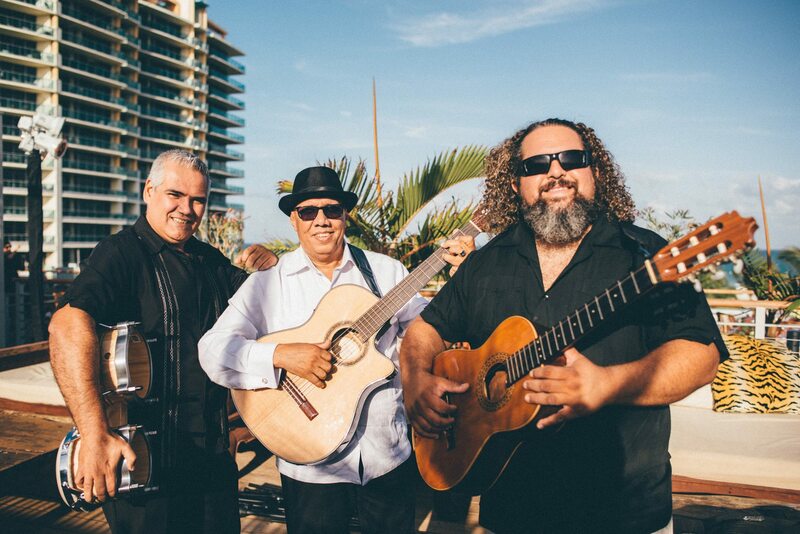 From Son Montuno, Guaracha, Boleros, Nengon, and Bolero Son, this dynamic ensemble brings the listener back to a time when Trio Matamoros, or Ignacio Piniero ruled the Cuban music world. The era when popular music was Cuban Music and Son Montuno was influencing music throughout the globe. From time to time, Cortadito is backed by a variety of guest musicians, which gives the group a sound reminiscent of the Buena Vista Social Club. Jose Elias founded the band alongside Julio Cesar Rodriguez Delet from Santiago de Cuba in November of 2011 after a 12-year stint with Conjunto Progreso that garnered him a Grammy nomination for his participation in the album Masters of Cuban Son. The duo was an instant success and were invited to perform at the Fingerlakes Grassroots festival in Trumansberg, NY. They released their first CD titled Abriendo Caminos in 2012, which featured one original composition by each of the artists “Delicias Caribeña” (Elias) and “Te Lo Perdiste” (Delet). In 2013, Julio Cesar moved to Houston, Texas and was replaced by Humberto Upierre from Guanabacoa, Cuba. The group then expanded into a trio which included percussionist Andres Polanco Rivas from Holguin, Cuba. 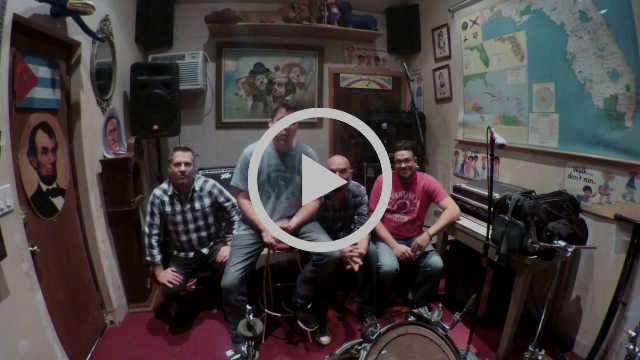 In 2015, the group reunited with Julio Cesar to record what would be the songs for their next release, which included the participation of double bass player YorgisGoiricelaya (Albita, Oscar De Leon) from Matanzas, Cuba. From 2015 to 2017 the group added various musicians to the roster, including the likes Eduardo Saborit on vocals and rhythm guitar from Santiago de Cuba, percussionist Santiago McCook, Wilfredo Fuentes Cespedes who recorded and toured with Eliades Ochoa, and Horacio Rodriguez, who worked with Orquesta Aragon from 2000 to 2016. Most recently, the group has added double bass player Alberto Pantaleon, who has toured with the Buena Vista Social Club and Eliades Ochoa. For more information about the band, visit www.cortaditoson.com. 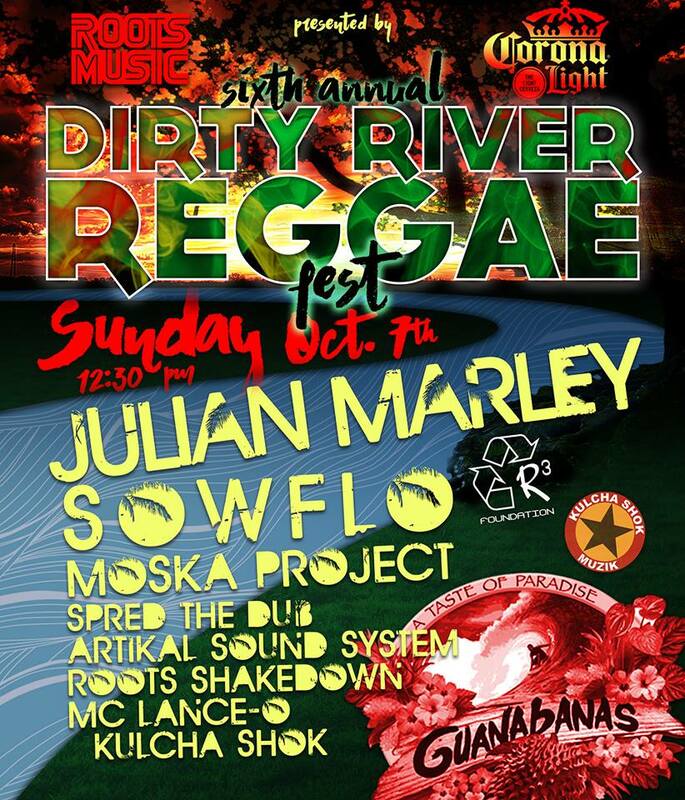 Event presented by Roots Music, Inc. features reggae royalty, nationally-touring acts and local faves in an all-day, all-ages free show beginning at 12:30 p.m.
Jupiter, FL – September 20, 2018 – One of South Florida’s most popular roots and reggae festivals returns to Guanabanas Island Restaurant & Bar for a sixth straight year, this time featuring one of the genre’s most popular and recognizable names, Julian Marley. This event, sponsored by Corona Light, will also feature SOWFLO, Moska Project, Artikal Sound System, Spred the Dub, and Roots Shakedown, and will be hosted by Lance–O from Kulcha Shok. Free admission and all ages are welcome; Guanabanas is located at960 North Highway A1A, Jupiter, FL 33477. “We are very stoked to have Julian headline this year’s festival, which will be a treat not just for reggae fans, but fans of music in general,” says Guanabanas’ Talent Buyer Matt Cahur. “I’m equally proud to showcase all the other acts in what will surely be our best line up yet.” Cahur heads up Roots Music, the Jupiter-based music management, production and promotions company that organizes the festival. He’s also the lead sound engineer at Guanabanas. As a son of Bob Marley, Julian is well-known to fans throughout the world. A musician, singer / songwriter and producer, he’s also a humanitarian, contributing to relief efforts in Haiti, as well as youth programs in his native London. He’s been active as a solo artist or in collaboration with his Marley siblings since releasing his 1996 solo debut Lion in the Morning. Ju-Ju, best known for blending reggae with ambient psychedelia, is currently touring the U.S. with the dub / electronica masters Thievery Corporation. Additional information available here: www.julianmarley.com. SOWFLO are South West Florida’s rock / reggae musical torchbearers. Based in Naples, FL, the band have been crisscrossing the American mid-west this summer, promoting their full-length debut Such is Life and their latest single called “If You’re Lost”. The quintet’s sound is equal parts rock, reggae, acoustic, hip-hop, dub, and surf, mixed in with good vibes and ganja. More details: www.sowflo.com. Based in Jupiter, Moska Project specializes in Latin reggae / rock. Semi-regular performers at Guanabanas, particularly during the monthly Noche Latinaseries, the band recently released a new single called “Al Viento” (“To the Wind”). The six-piece’s sound is an amalgamation of Latin / reggae / rock artists such as Oscar de Leon, Gilberto Santa Rosa, Gipsy Kings, G. Love, Ben Harper, The Doors, Cake, Fishbone, Faith No More, and others. Additional info: www.moskaproject.com. Artikal Sound System fuses American, Jamaican and Hispanic reggae cultures. 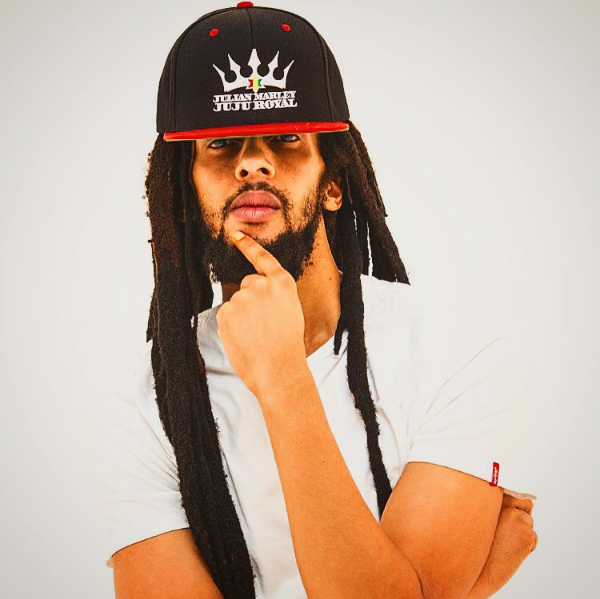 They perform nationally and internationally, and have collaborated with artists from the world reggae scene including: The Abbysinians, Apple Gabriel of Israel Vibration, and Biggz General, a descendant of Bob Marley. Their latest release is called “Crave You”, and the band regularly performer throughout South and West Florida. More details: www.artikalsoundsystem.com. South Florida’s Spred the Dub are known as purveyors of “Good Time Reggae”, which essentially combines elements of soul, funk and R&B over a foundation of rocksteady, ska and roots reggae. Based in Palm Beach, they are regulars throughout the West Palm and Fort Lauderdale reggae scene. Their latest release is called Friends and Enemies, which is their third release overall. Learn more at www.spredthedub.com. The roots / reggae / dub / indie quartet Roots Shakedown also call Palm Beach home. Listeners have been captivated by their dynamic live shows and memorable, sun-drenched hooks. The band can be seen at most major college towns and festivals throughout the Sunshine State. To find out more about the group, please visit their website: www.rootsshakedown.com. The R3 Foundation will be on hand to raise money for a water bottle filling station initiative aimed at local schools. For more information, please visit www.Guanabanas.com or call 561.747.8878. Latin funk band to play a Latin Soul party at the Wynwood film set and music venue beginning at 9 p.m.
Hialeah, FL – September 19, 2018 – There many are reasons why Electric Piquete are two-time Miami New Times’ “Best Latin Band” award winners, and one of them is that the band revel in their Hispanic roots. They have fully incorporated Caribbean rhythms into their sound, have covered and recorded tracks by standout Latin artists such as Celia Cruz, Mongo Santamaria, Cheo Feliciano, and have even written songs about Jose Marti and Cuban beaches. On Saturday, October 6, 2018, Electric Piquete will celebrate their Hispanic Heritage at the Toejam Backlot in Wynwood (150 NW 21st St, Miami, FL 33127) with a special concert at the private event space / studio. Used largely for photo and video shoots, the space includes indoor and outdoor areas, a proper stage with concert sound and lighting, as well as one of the largest prop collections in all of South Florida. “We celebrate our Hispanidad all year round, but are looking forward to playing at the Toejam Backlot for the first time in concert with the rest of the country’s salute to Hispanic Heritage,” says Michael Mut, co-founder, bassist and band leader. “We invite everyone out to this wonderfully stimulating venue for a night of live Latin soul / funk / fusion, food trucks, fun and more.” Admission is $10 at the door; 21 and over are welcome. Electric Piquete’s music has already been licensed by Lexus, and featured in the Emmy-winning Joe Cardona documentary Miami Boheme, plus an episode of CNNGo. The band is a veritable melting pot of influences that range from rock to jazz, and spiced with everything in between: funk, fusion, old-school salsa, progressive, and R&B. Though mostly instrumental, they feature vocals with three-part harmonies as well as some rapping on several numbers. The band is currently running a crowd-funding campaign for a new release on vinyl, CD and digital – those interested in contributing to the cause can navigate here: https://igg.me/at/EPIGG. In 2016, they issued the Singles Collection, which encapsulated the group’s most recent and noteworthy works. Last year a live version of the relatively new track “Chunk” surfaced on the band’s Soundcloud page. Electric Piquete also features co-founder Ed Rosado on drums, Chris Correoso (guitar), and Rich Dixon on trumpet and flugelhorn. The band’s sound is very often augmented by Raymond Ayala on percussion and vocals, Charles Gardner on keyboards, and Robert Smiley on tenor sax, flute and vocals. Occasionally, the band features special guests Damian J. Sanchez on saxophones, flute, and vocals, Maco Monthervil on lead vocals, and Jose Miranda on trombone. 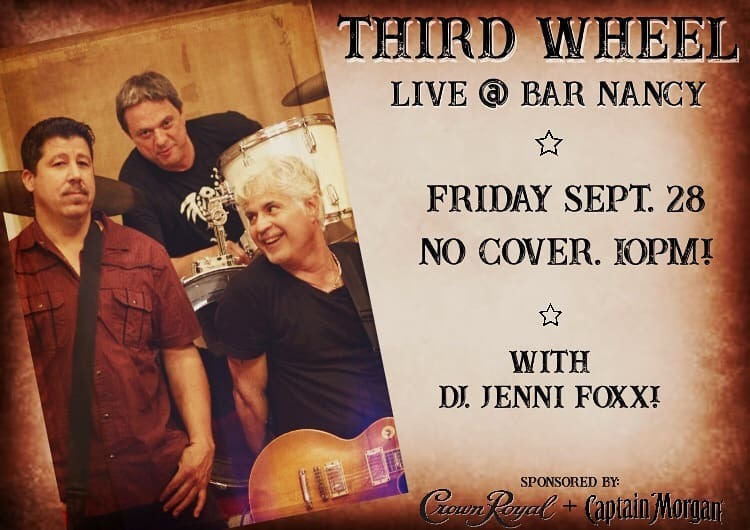 Miami, FL – September 17, 2018 – Bar Nancy will host cover band ThirdWheel for the first time on Friday, September 28, 2018, beginning at 10 p.m. There is no cover and 21 and over are welcome to attend. Opened in 2017, the Nancy is located at 2007 SW 8th St, Miami, Florida 33135. The band’s repertoire consists of well-known 70s, 80s, and 90s rock and alternative staples. DJ Jenni Foxx will also be spinning that night. Founded in 2017, Third Wheel unites a trio of musicians with a long musical history together, featuring guitarist / vocalist Tony Medina, drummer / vocalistMonchy Coruguedo, and bassist / vocalist Michael Mut. Medina and Mut played in the Sony Discos-distributed Pawnshop Drunks in the 2000s, and Coruguedo and Mut have been the Birdman’s Clambake rhythm section since 2014. Bar Nancy’s décor theme is colonial-era nautical, and once inside, the sense is one is in the galley of a ship. With wood-lined walls, tables and chairs, a natural essence is prevalent. Nancy offers a sizable selection of draft and canned beers, as well as specialty cocktails. An outside patio with seating is available. The bar also showcases a monthly “songwriters in the round” night hosted by Juan Turros, as well as a weekly games and trivia night (Mondays). For more information, please visit https://nancy305.com, call 305-397-8971, or navigate to the venue’s social media pages (Facebook / Instagram).